The San Pedro Sun first reported on November 29th about an incident in which 43 year old nurse Lisa Marie Merz, US National of Syracuse New York, was arrested, charged and found guilty for several offences while vacationing on Ambergris Caye. 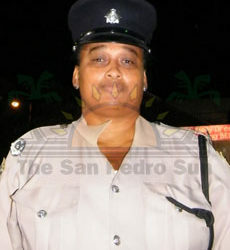 The arresting officer was the Head of the Tourism Police Unite in San Pedro, Corporal Sharmane Young. Following the incident involving the tourist, Young was arbitrary and coincidentally transferred without a reason, believed to have been caused by political interference. According to San Pedro Police, both the Minister of Tourism Manuel Heredia Jr and the Commissioner of Police David Henderson became involved in the arrest of Merz, eventually securing a police bail the day of her arrest. Since The San Pedro Sun first broke the story, the transfer of Young has the subject of national discussion prompting the Heredia Jr. to speak about the issue. Heredia told the media on Wednesday December 5th that he indeed became involved in the incident and had in fact has requested the transfer of Young months prior to the incident. Heredia said that the reason he became involved after being informed of Merz’s arrest was because she has been bringing tourists to the country for over 15 years. “I went immediately to the station, and the officer that was in charge over [there] said that Cpl. Young is not in office, and she will probably not be in until later in the night, or the next day… I managed to speak with the officer in charge of San Pedro, Mrs. Robinson and I asked Mrs. Robinson about the situation with this tourist. Mrs. Robinson said, 'I heard from Cpl. Young that the tourist was behaving not in a very polite manner. I spoke to the tourist who said, 'Minister, thanks for visiting me firstly, because I don't think any other minister would have done that…” Immediately the lady responded, 'I accept that I was a little upset, but that was because Cpl. Young was using excessive force with me. She wanted to take me. I have surgery on both arms, and my hands cannot bend behind,” and she showed me… she said, 'the reason I started to use insulting words is because I couldn't stand the pain that was being done to my arm.' Nonetheless, I told her that what I would try to do is I will speak to Mrs. Robinson ask her if she can grant bail. Bu, Mrs. Robinson was very open to say, 'Minister, I will not wake up my officer to grant bail to this tourist.' I called Aragon (Assistant Commissioner of Police Elodio Aragon) who is in charge at Eastern Division. Aragon immediately called Mrs. Robinson. He said, 'Charge the lady if you will charge her, and then grant her bail.' According to Mrs. Young I wanted the lady released without any charges. That has never been my intention,” Heredia said in his defense. In speaking about the allegation that as a result of his intervention that Young is being transferred from the island, Heredia said "And I will be - I will - no apologies, right. That indeed for a few months before that, I had asked Mr. Aragon - I think - the Commissioner, if they transfer this officer elsewhere because she was not performing in the best possible manner that is supposed to - when she arrived on the island, she was the best of the best, I believed, that we have had at a person in charge of the Tourism Police. But after that, I personally saw that she was not performing to the best." The incident with Young and Minister Heredia involvement has captured national attention with callers into the national talk shows calling on the Prime Minister of Belize, Hon Dean Barrow to make a formal statement regarding the actions of one of senior Cabinet minister. The PUP committee in San Pedro also wrote to PM Barrow, asking for Young to be reinstated to San Pedro Town and to reprimand Heredia Jr., recommending that he steps down as Tourism Minister. 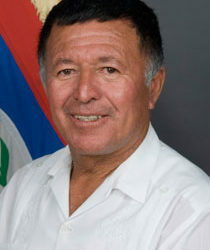 Also adding to the public pressure is the National Trade Union Congress of Belize (NTUCB) who issued a press release in which they condemn the “purported involvement” of Heredia in the transfer of Young. “The NTUCB wishes to condemn in the strongest terms possible this type of action; since we perceive it as a political interference, inhibiting the legitimate work of our trained law enforcement personnel. We wish to sound the warning that this type of political misstep will not be tolerated,” outlined the press release. It goes to say that “ The NTUCB asks that the Government of Belize moves swiftly to address this matter; if only to diffuse the mounting tide of public disdain and to further dispel the notion that; misuse/abuse of political power, is the modus operandi of duly elected government officials. Furthermore, the congress submits that this transfer should be immediately rescinded and that the Minister of Tourism offers to the Belizean populace a public statement on this matter. But the NTUCB press release says that four other officers stand the same fate of Young. “Finally, we have received word that at least four other police officers are in a similar situation and about to experience fates in similar fashion as that meted out to the San Pedro officer because of political interference from elected officials. Let it be known that the NTUCB will not condone this sort of practice and stand ready to disclose further details if these cases are not addressed. Speaking to The San Pedro Sun on Friday November 7th Minister Heredia Jr. explained that his position remains the same and will not respond to both releases. According to Minister Heredia, he will not be dragged into a ‘back and forth’ since he wants to maintain a level of respect towards Young and would not want to be the person to outline corruption accusations against her. Minister Heredia added that he will leave the comments to the top brass of the Police Department if they so desire to address the concerns outlined by the PUP and the NTUCB.